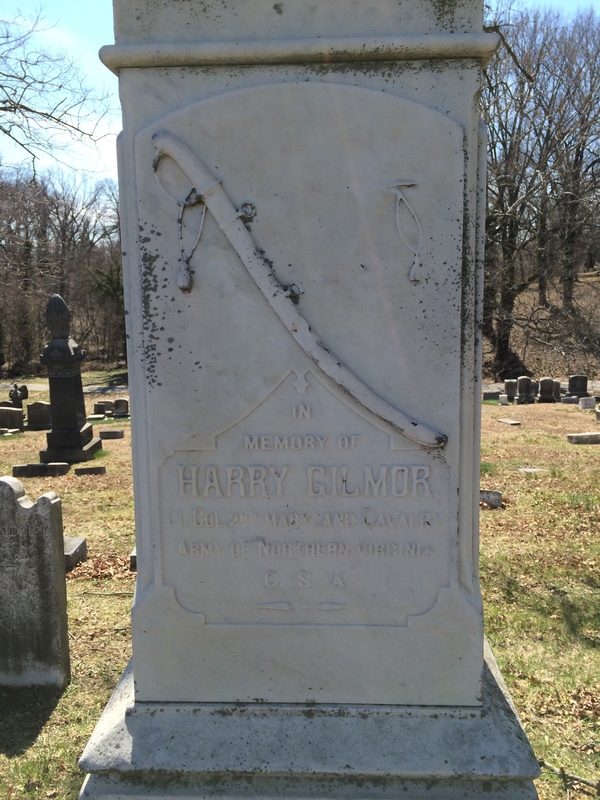 The first Civil War burial that I discovered at Loudon Park was Confederate Col. Harry Gilmor. 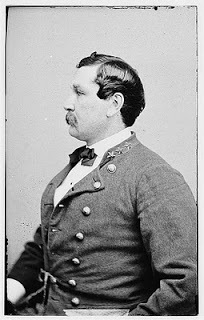 He was present at the Battle of Gettysburg as a Major in command of the 1st MD Cavalry Battalion (CSA) – part of Fitzhugh Lee’s brigade – though they did not participate in the action at the East Cavalry field.
. He didn’t fight to the end of the war though; he was captured by Union troops in February of 1865 while on a raid in West Virginia. After the war, he wrote a book about his experiences, and went on to serve as the Baltimore City Police Commissioner for 5 years. Location of Confederate Hill. Map by Apple Maps. 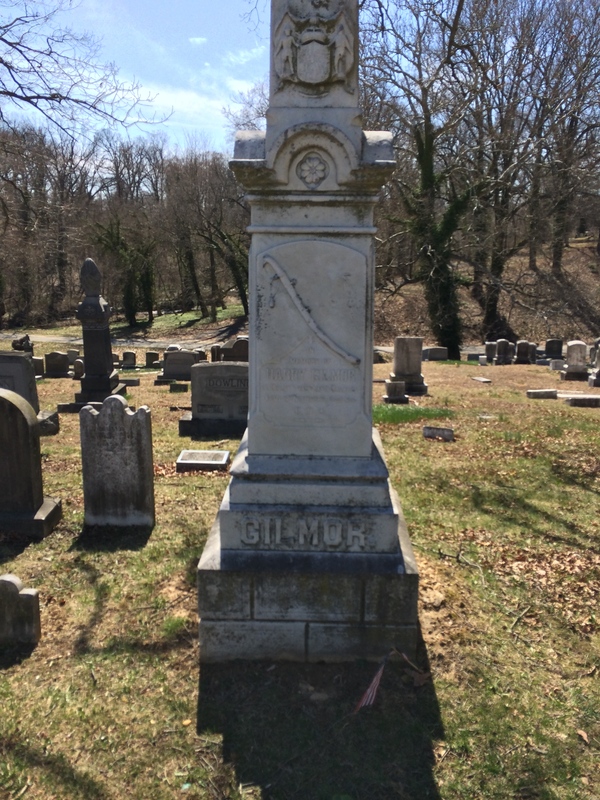 Harry Gilmor’s Monument. Photo by the author. Detail on the front of Harry Gilmor’s Monument. Photo by the author. Detail of the left side of Harry Gilmor’s Monument. Photo by the author. Detail of the rear of Harry Gilmor’s Monument. Photo by the author. 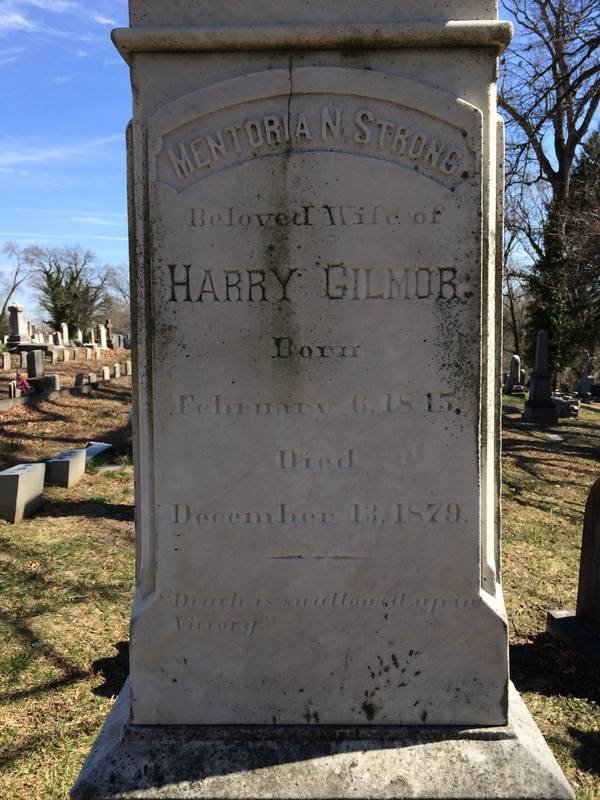 Detail of the right side of Harry Gilmor’s Monument, marking his wife’s burial. Photo by the author. As you may guess (with a whole section named “Confederate Hill”) there are certainly a few more prominent leaders with Gettysburg connections buried at Loudon Park. In the next installment, we’ll show the grave of one of the infantry commanders from that battle. 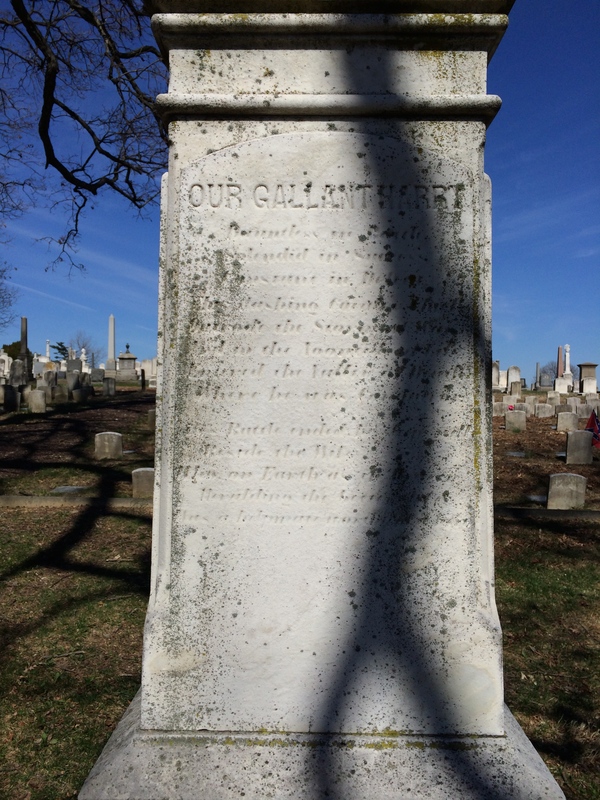 Earlier today, I posted about the burials in Loudon Park Cemetery with connections to the Lincoln Assassination, but these are not the only graves in Baltimore that have a connection to that tragic event in our nation’s history. 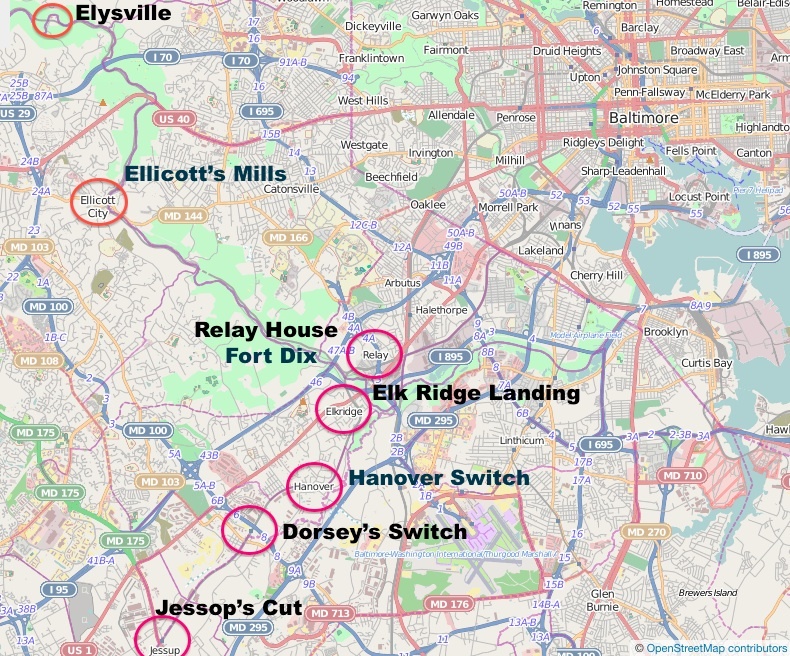 Eventually, I’m going to get around to covering each of these on the blog – maybe around the anniversary of the trial – I just wanted to make a note about those local Baltimore connections while the topic is fresh. 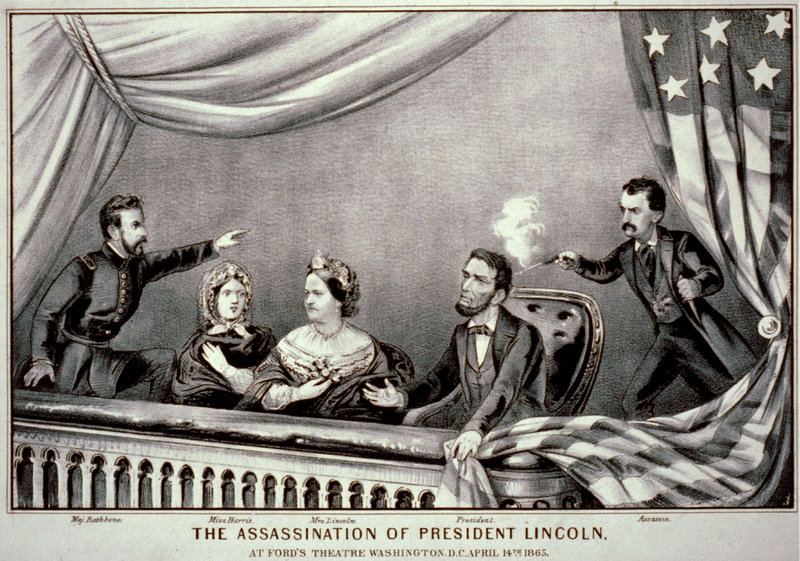 The Assassination of President Lincoln. 149 years ago tonight, John Wilkes Booth famously shot Abraham Lincoln during a performance of the play Our American Cousin at Ford’s Theatre in Washington, D.C. While the Civil War had more-or-less ended a few days before with the surrender of General Robert E. Lee’s Army of Northern Virginia, the bloodshed and bad feelings clearly had not. 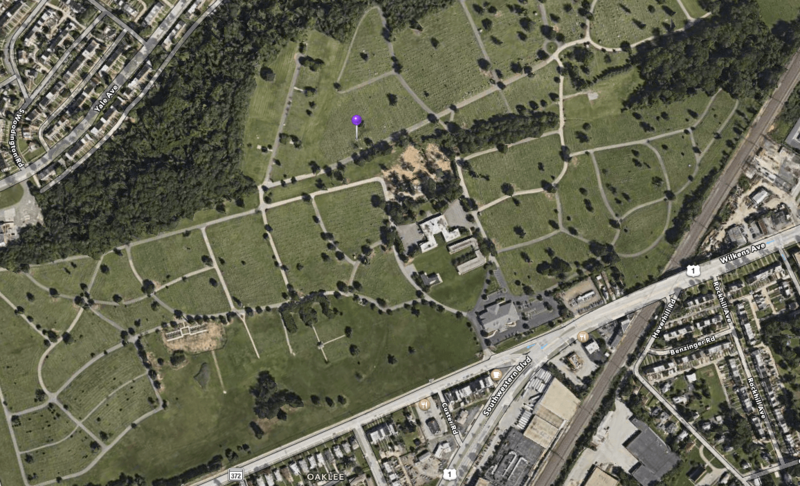 There are two burials in Loudon Park Cemetery that have a tangible connection to this tragic event in U.S. history. The first is John T. Ford – the owner and manager of the aptly-named Ford’s Theatre. A friend of John Wilkes Booth, Ford admitted to mentioning in one of their conversations that Lincoln would be attending the play, and he was thus jailed as a suspected member of the famous conspiracy. After more than a month in prison, Ford was finally cleared of wrong-doing and went on with his life, albeit embittered by the experience of being falsely accused of a capital crime. 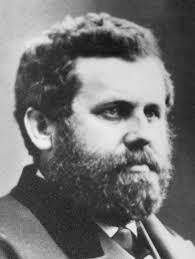 He continued to manage many theatres in the region until his death in 1894. Location of John T. Ford’s gravesite. Map by Apple Maps. 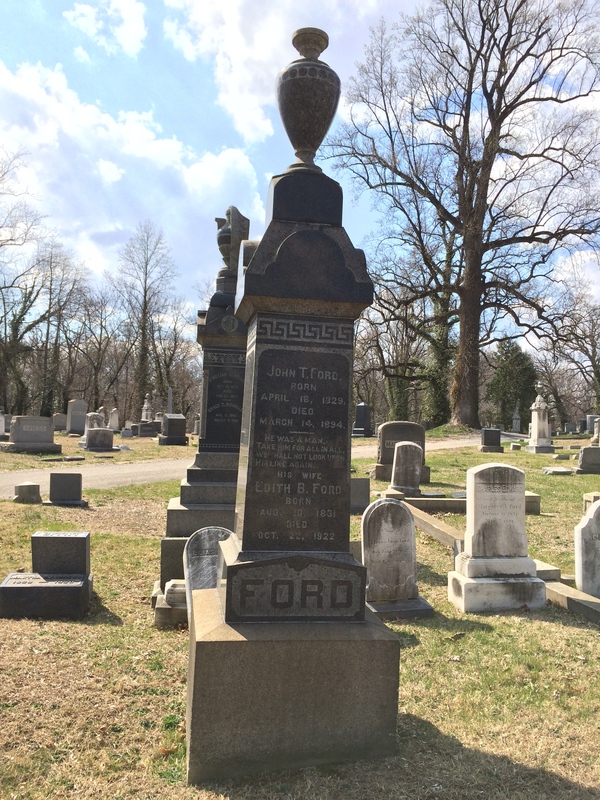 John T. Ford’s Gravesite. Photo by the author. Another Loudon Park Cemetery connection to that night is Samuel J. Seymour. As a 5 year-old boy, he attended the April 14, 1865 performance of Our American Cousin at Ford’s Theatre with a family friend and was seated directly across from the Presidential box. While he didn’t remember seeing the gunshot, he did see Booth leap from the balcony to the stage, and his immediate reaction was that the commotion in the theatre was due to the man who fell. 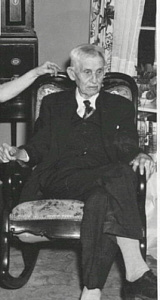 When Mr. Seymour passed away in 1956, he was the last surviving witness of the assassination. He made an appearance on the television game show I’ve Got a Secret a few weeks before his death where his story was told. A video from that appearance has made its way onto YouTube. Probable Location of Samuel J. Seymour’s gravesite. Map by Apple Maps. Next time, we’ll get to some of the Confederate burials in Loudon Park that are directly related to the Battle of Gettysburg. Mary Pickersgill. Photo from the Maryland Archives. 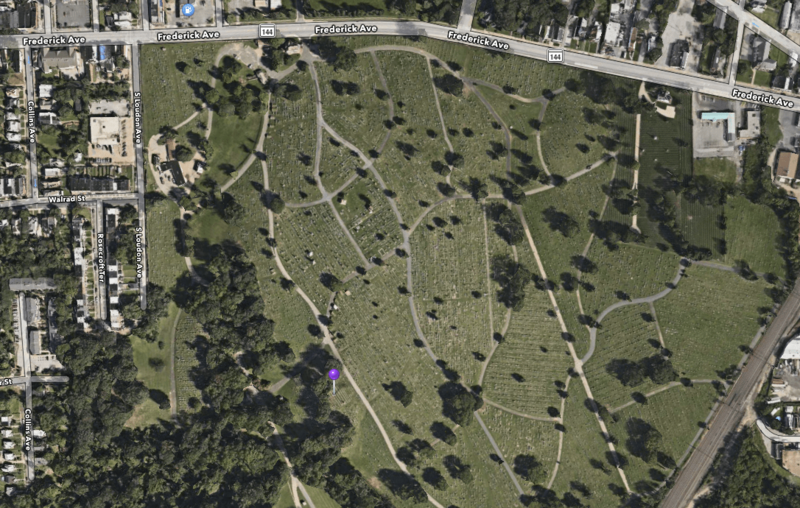 So I’m going to start my series on Loudon Park with a non-Civil War burial, but it’s a big one. 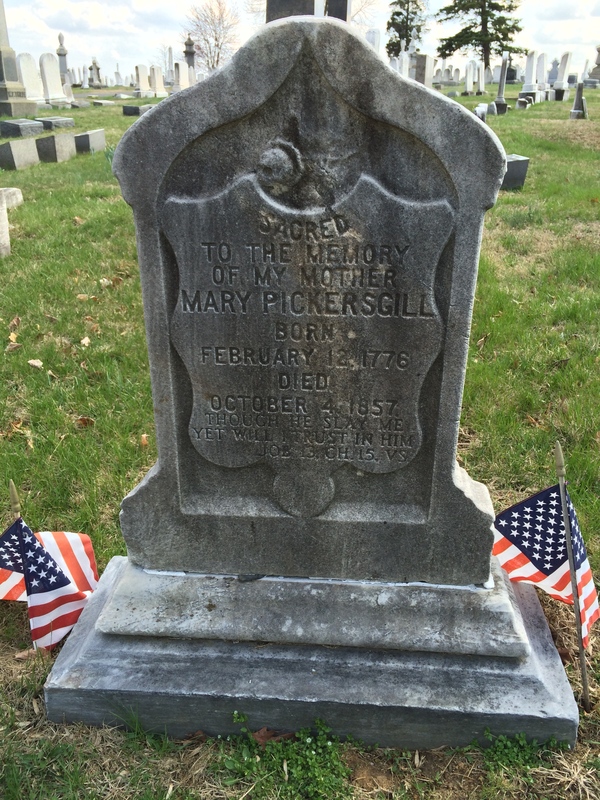 Mary Pickersgill is probably the most famous person resting in Loudon Park. Apart from being a successful business owner and charitable figure in 19th century Baltimore – remarkable achievements for anyone let alone a woman back in those days – she is best known for sewing the giant garrison flag that flew over Fort McHenry during the Battle of Baltimore on September 12, 1814. Her headstone is small and understated, but a plaque that briefly explains her importance was placed on her grave by a few historical preservation groups in 1976. 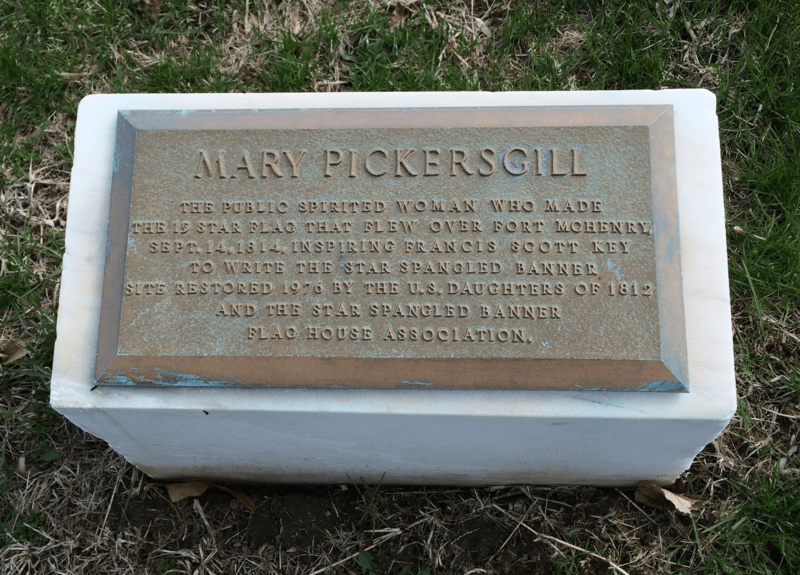 In addition, the old cemetery gatehouse has a large, 15-star Star Spangled Banner draped on its eastern wall at all times – a subtle tribute to Mrs. Pickersgill. 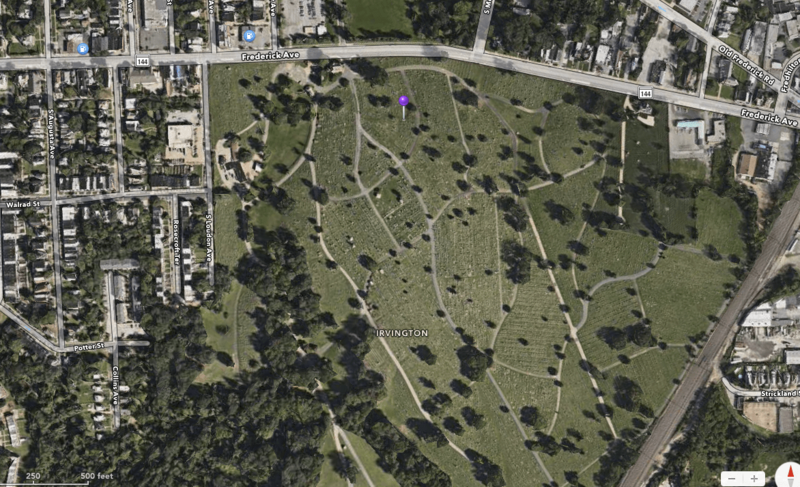 Location of Mary Pickersgill’s Gravesite. Map by Apple Maps. Close-up of Mary Pickersgill’s Headstone. Photo by the author. The historical plaque placed at the grave. Photo by the author. If you weren’t actually out looking for her grave, you’d never know it was here. With so many other large, ostentatious monuments in Loudon Park, seeing a simple set of markers is actually somewhat refreshing. It certainly speaks to what kind of woman she was. In the next installment, we’ll see a pair of graves relating to one of the most famously shocking events of the Civil War era. This is a very long post about a piece of Skillman family history. There’s plenty of general interest history in here as well, but I go very deep in the weeds in some places. If you’ve stumbled onto this post via a web search and think that we may be related, please drop me a line! 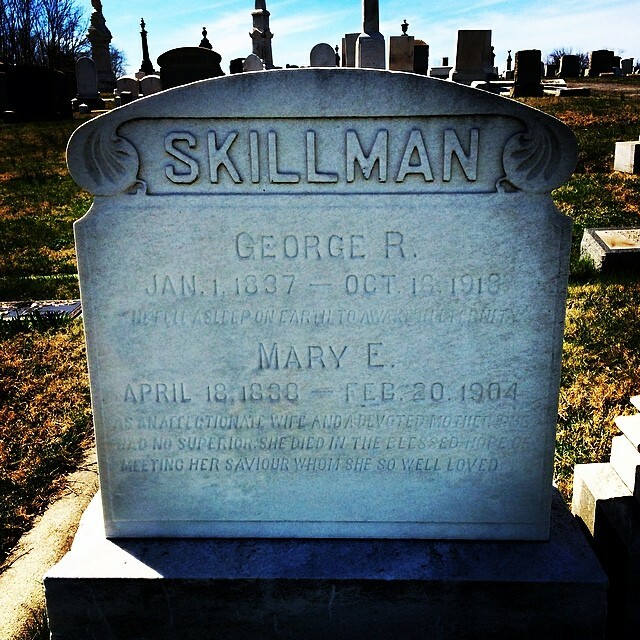 When I recently wrote about my family’s connection to the Great Baltimore Fire, it got my curiosity going again about my great-great-great-grandfather, George R. Skillman. 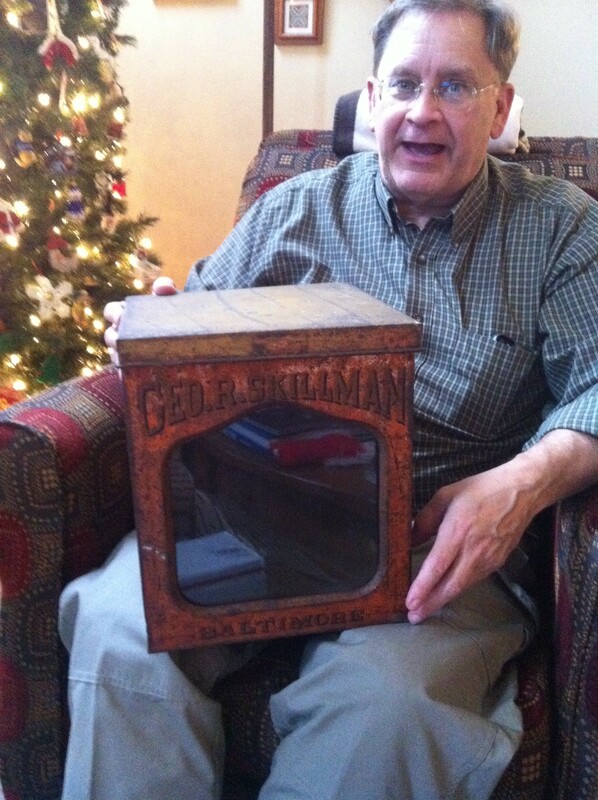 Since there are so many men named “George R. Skillman” in our family, we’ve always called him “Cracker-baker George”. 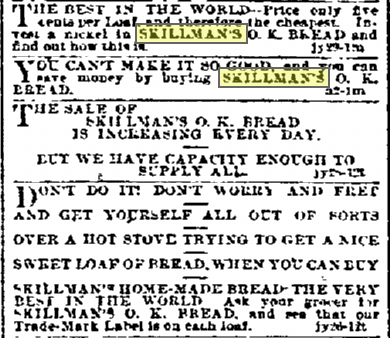 George R. Skillman, the Cracker-baker. Photo courtesy of George Skillman. For a long time, that was pretty much all we knew about him: he lived in Baltimore, had some type of association with the Maryland Institute, and made a name for himself in cracker-baking. That was it. In recent years, I’ve done some digging on Ancestry, and was able to locate some Census records and his Civil War draft registration on there, but my mission at the time was to try to get information on the whole family, not to just drill down on one or two members, so I never got that deep on his life story. That all changed with the anniversary of the Great Baltimore Fire. I wanted to find out more about who this guy was. I collected all the data that I had from the traditional family story, to the Census records I found online, and went down to the main Enoch Pratt library, hoping that they would have some good sources. I’m happy to report that they were tremendously helpful. I was able to find some information about companies he worked for, and even some clues about a few other relatives in Pratt’s collection of books. Searching the city directories and the online archives of The Baltimore Sun (which the library subscribes to) were instrumental in putting some of the pieces together. George R. Skillman was born January 1, 1837 in Baltimore. His parents were F. Robert J. Skillman and Naomi Sophia (Miller) Skillman. He was a member of the Methodist Episcopal Church. 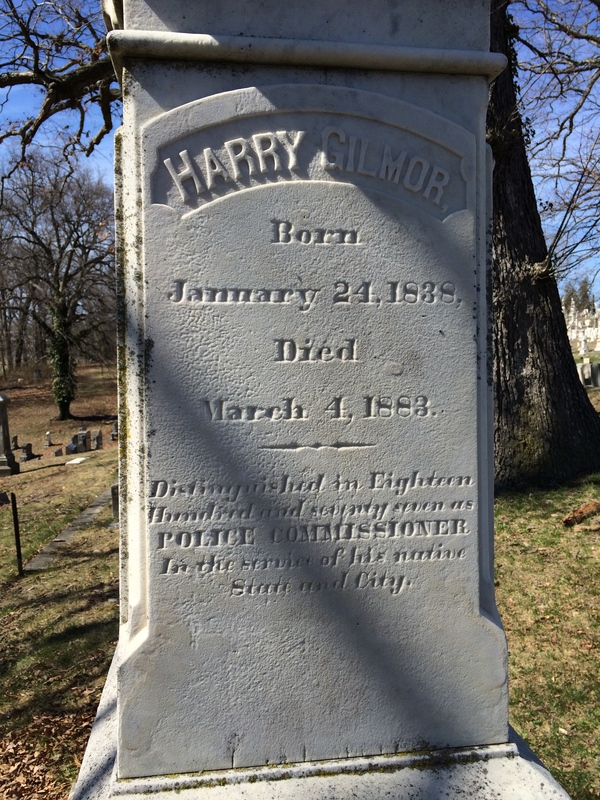 His family attended services at High Street Methodist Episcopal (originally built at 230 S. High St. – now a parking lot) and later in life, at Grace Methodist Episcopal in Baltimore. The first reference to him that I found was in The Sun on March 8, 1858. He apparently attended a meeting in Temperance Hall in Baltimore, where the attendees were discussing their support for “The President’s Plan” regarding Kansas. This is a reference to the Lecompton Plan for Kansas’ state constitution – a constitution that would have allowed slavery in the Sunflower State. From what I’ve been able to find, George was a life-long Democrat, so it isn’t surprising that he’d be supporting President Buchanan as a young man. On April 22, 1858 he married Mary Elizabeth Pierce. The couple would go on to have 8 children, but three of them wouldn’t survive past their twenties. My particular branch of the family is descended from his 4th son, Robert G. Skillman. He registered for the draft in 1863, listing his occupation at the time as “Clerk”. The 1864 Woods’ City Directory has him living at 90 N. Eden Street (a house that no longer exists), and shows that he’s working as a “Bookkeeper”, but on January 1, 1864, James Beatty announced in The Sun that he was entering into a copartnership with his clerk, George R. Skillman. His name is called in the draft June 23, 1864, but he doesn’t end up going to war. By June 28, he’d found a substitute to serve in his place. You could do that back in those days, especially if you were a partner in a prominent manufacturing business. The same city directory in 1865-1866 shows the first reference to the company that he made his name working for: James Beatty & Co. Steam Cracker, Cake, and Ship Biscuit Bakers. This firm seems to have been one of the largest commercial / industrial baking operations in Baltimore at the time. James’ grandfather was also named James Beatty (what is it with all these people having the same names? 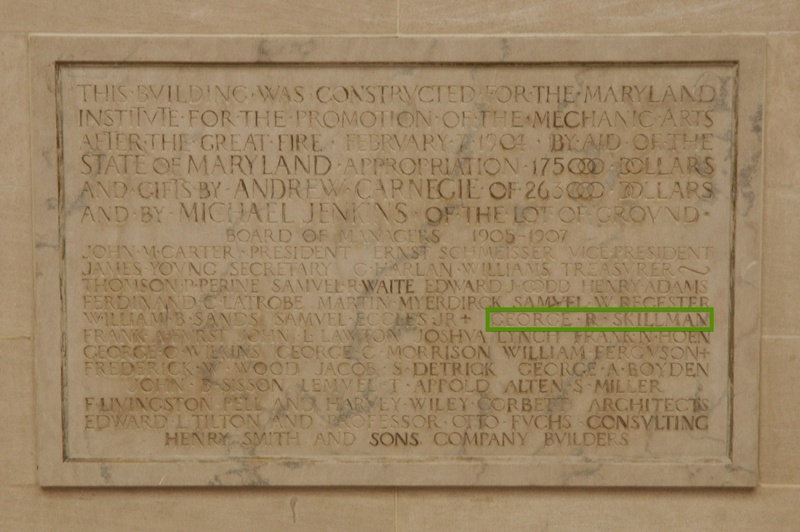 ), and was the U.S. Government Naval Agent in Baltimore during the War of 1812. The Beatty’s were a prominent (and rich) family in 19th century Baltimore. Civil War nerds like me will also appreciate that “ship biscuit” is the naval term for hardtack, and from records I’ve found, the company was definitely a hardtack supplier for the Union army. The company’s address is listed as “Nos. 92, 94 & 96 Dugan’s Wharf, near Pratt Street” – what is now known as Pier 4 at the Inner Harbor. In the 1870 Census, George lists his occupation as “Baker”, and on April 4, 1871, he’s granted U.S. Patent 113,356 for his Cracker Machine. Clearly, he was an innovative force in the industry. In an 1873 advertisement for the James Beatty Co., George is still listed as being James’ partner in the business. My feeling is that George became the brains, or the heart of the operation, and that James was providing the capital and the business side. Sometime before 1878, George moves the family to a nicer house at what is initially listed as “329 Myrtle Ave.”, but later listings all show the property more accurately as being at 1408 Myrtle Ave (the current house at this address was built in 1920). On top of the tower of the building was placed one of these lights, with a reflector – a crude forerunner of the now well-known electric searchlight. An incident of this application was that when the light was thrown towards the home of Mr. George R. Skillman, on Myrtle Ave., and Mr. Skillman using the other unique exhibit, the telephone, read by it a newspaper extract to an auditor at the other end of the line. Alexander Graham Bell had his successful test with the telephone just 2 years before. George was certainly a man who wanted to be on the cutting edge of technology. His association with the Maryland Institute didn’t stop at serving on the board, though. An advertisement in The Sun on February 23, 1880 announces that “George R. Skillman, esq.” will be giving a lecture that evening about “Saalbec, Athens, and Pompeii”. So he’s a history buff, too. 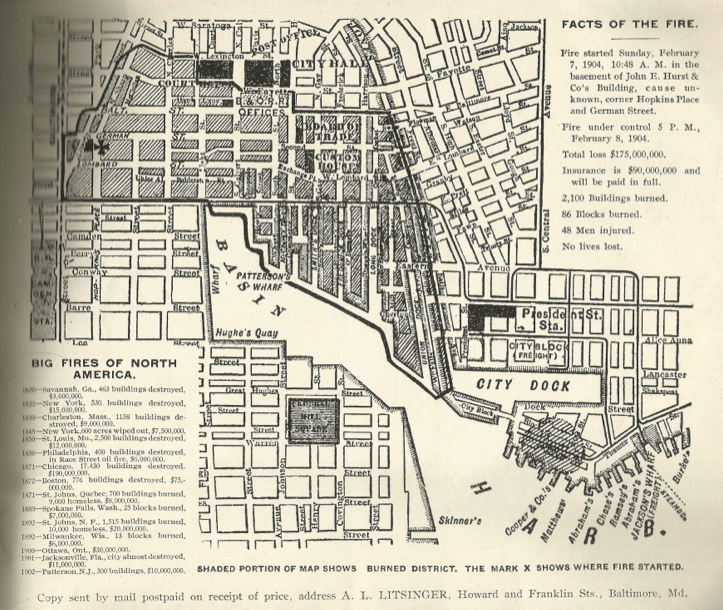 In 1886, a book called “Half Century’s Progress of the City of Baltimore” was published. 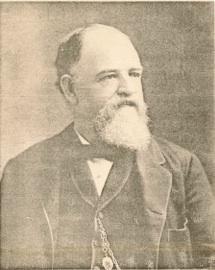 It included a one-page profile of James Beatty & Co., that mentioned how James took over the company from his father in 1858 and “some years later” added George R. Skillman as a partner. The article goes on to say that George “retired” from the firm in 1884. This isn’t entirely accurate, it seems. An announcement in The Sun on January 1, 1885 states that the partnership had been dissolved, and that James was bringing his son onboard in George’s place. It goes on to say that George had purchased another piece of property on Greene St., and would be starting his own bakery there. Sunday afternoon, a fire destroyed the three upper floors of George R. Skillman’s cracker bakery, in Baltimore. The damage to the building is estimated at $10,000 and to stock and machinery $10-15,000. The 1886 Woods’ City Directory lists “Skillman, George R.” under the category “Steam Bakers”, with an address at 51-57 N. Greene St. This was the location that was destroyed by the aforementioned fire. Luckily, George was fully-insured, and he rebuilt the business at a location up the street. By 1887, that new listing has appeared as “George R. Skillman Universal Steam Bakery” at 203-211 N. Greene St. (now a parking lot for the nearby University of Maryland campus). 203-211 N. Greene Street as it appears today. Photo by the author. I think it’s interesting that his early ads are all about bread. In those days, most people baked their own bread at home. 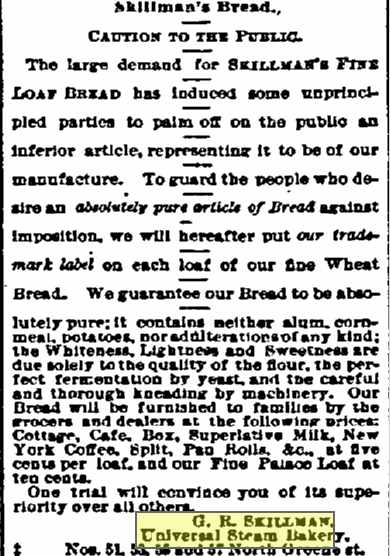 Even as late as 1910, only about 30% of bread was store-bought. His marketing push is based around his bread being an affordable luxury. He can make it better than you can yourself, and you might even save time and money. Rather than relying totally on local grocers carrying his bread, he also opens a full-service retail store at the bakery sometime in the 1890s. On January 1, 1892, an advertisement in The Sun announces that my great-great-grandfather, Robert G. Skillman, has been made a partner in his father’s business. Only 26 years-old at the time, he is the eldest surviving son. At the same time, George continues improving on the state of the art in his industry. In 1892, he’s granted U.S. Patent 487,431 for a commercial oven he’s invented. It’s around this time though, that things look like they start going downhill a bit. On January 27, 1891, The Sun mentions a court case, Edward A.F. Mears v. George R. Skillman. I don’t have any of the details of the case, but I know that George lost, and had to pay a sum of $45 to Mr. Mears. George R. Skillman & Co., proprietors of the bakery at 203-211 N. Greene Street and of the restaurant at 225 N. Eutaw Street, made an assignment for the benefit of creditors yesterday to George D. Iverson, trustee. The bond was for $15,000, double the estimated value of the assets, which are said to consist mainly of special machinery. The liabilities, it is said, will aggregate about $30,000….They said the assignment was due to the low price of crackers and cakes, and to depression in the business. George D. Iverson, Trustee of George R. Skillman & Co., bakers, under deed of trust for the benefit of creditors, yesterday reconveyed the trust property to the firm, who have settled with all their creditors. George R. & Robert G. Skillman are the members of the firm. So it looks like George has found a way to pay-off all the people he owed money to. He must have come into some quick cash…. 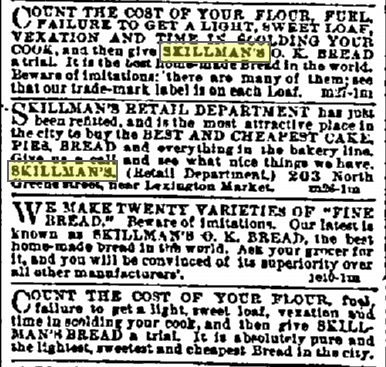 Fast forward to December 4, 1895 when The Sun ran an ad announcing that the Skillman Universal Steam Bakery had been purchased by the New York Biscuit Co. The ad expressed the hope that their customers would continue to support the business. George R. Skillman is listed at the bottom as the “Manager”. In 1898, the New York Biscuit Co. (now owners of the Skillman Bakery) merged with the American Biscuit and Manufacturing Co., creating the National Biscuit Co. in the process. This conglomerate would later shorten its name to Nabisco. By 1900, they’ve consolidated their operations in Baltimore to the 203-211 N Greene St. location, and George R. Skillman is still the Manager. But there’s still more trouble brewing. The Sun publishes an article on July 25, 1899 entitled “To Fight the Trusts – Wholesale Grocers Declare War on Big Corporations”. In the article, its reported that the local grocers don’t want to deal with the larger suppliers, and several have agreed to only buy from smaller, local providers. One of the companies that is specifically targeted in this protest is the National Biscuit Co. that George sold-out to, and is now managing the Baltimore operations of. But there’s about to be another plot twist. Skillman Bakery (National Biscuit Co.), 203-211 N. Greene St., Elmore B. Jeffery, Manager. 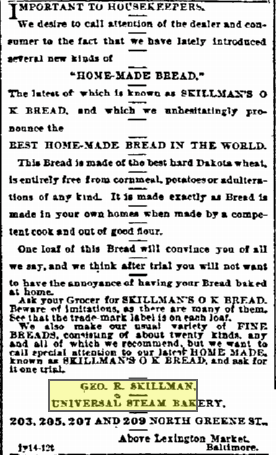 Skillman, George R. (Union Biscuit Co.), 115 S. Frederick St.
National Biscuit Co., 203-211 N. Greene St.
Skillman Bread & Pie Co., 1516-1524 N. Regester St., George R. Skillman, Proprietor. So when the big, national baking interests had become the bad guy, George removed himself from that situation and started up another operation of his own. And look at how he’s marketing the new venture: “biscuits” and “crackers” in 1903 are products that are made almost exclusively in large commercial bakeries. “Bread” and “pie” are still primarily products that are made at home by most people. He’s trying to make this new business at least appear to not be a big, scary company. Other than the damage to the Maryland Institute that I talked about in an earlier post, I don’t think George is personally affected by the Great Fire in 1904. All his properties are outside of the disaster area. He suffers a very personal disaster a few weeks later, though. On February 20 his wife Mary dies. 1905 is the last year that George is listed in the city directories as being the “proprietor” of the Skillman Bread & Pie Co., so it looks like his day-to-day involvement has slowed. Elmore B. Jeffery (who replaced George at National Biscuit Co.) is brought onboard as the Manager of Skillman Bread & Pie in 1906. How about that, huh? George has also left the family home on Myrtle St., and moved to 3617 Forest Park Ave (the current house on this site was built in 1920). I have to imagine that his wife’s death had something to do with both moves. In 1909, George sued the Skillman Manufacturing Co., claiming that they owed him $115 and that the company was insolvent. He won himself the company receivership in the case, and the managers of the firm were forced to admit that George’s claims were true. At this point, the company address is listed as being 110 S. Charles St. The old Regester St. location was sold in 1910 for $14,000 to a man who built an auto repair shop there. Skillman Bread & Pie Co. moves again to 104-112 W. Barre St. at least by 1912, and by 1914, it has completely disappeared from the city directories. It seems like the business had run its course. George is back in The Sun in 1912, though. An article on November 19 states that he had sold the property at 203-211 N. Greene St. (somehow, he must have re-bought the place) to the Lexington Storage and Warehouse Co., and the next year’s city directory lists him as the President of that company. The gig doesn’t last long, it seems. While he remains involved with the Board of Managers for the Maryland Institute, and as a Board Member for The Boys’ Home on Calvert and Pleasant St., by 1915, he no longer has an occupation listed in the directories. Sometime before 1917, he’s moved in with his daughter and son-in-law, George MacCubbin, at 3803 Clifton Ave (the current house at this address was built in 1910, so this seems to be the only house he lived in that still exists). He died in that house, October 18, 1918 at the age of 81, having led a very full life. He is buried at Mt. Olivet Cemetery in Baltimore. George R. Skillman’s Grave in Mt. Olivet Cemetery. Photo by the author. Some of the other bakers engaged in interstate trade in the early history of the industry and who contributed to its national importance were…Skillman, of Baltimore…. Husband, father, baker, inventor, technologist, historian, businessman, civic leader, and “contributor of national importance”. George R. Skillman, my great-great-great-grandfather, was all of these things. I was able to find a display tin from the Skillman Universal Steam Bakery in an antique shop on Maryland’s Eastern Shore. My brother and I bought it to give to my father this Christmas so that it can stay in the family. My dad holding a piece of family history. Photo by Sharon Skillman. The roots of the Skillman family in the Baltimore area go back for several generations. In a way, my immediate family may not have learned about those roots had it not been for the events surrounding the Great Baltimore Fire that I wrote about yesterday. Today, I want to tell that story. One of the buildings in Baltimore’s downtown business district back in the days before the fire was the Maryland Institute for the Promotion of the Mechanic Arts (which later became the Maryland Institute College of Art). Though the institution had been started in 1825, it had always rented space to hold its classes. 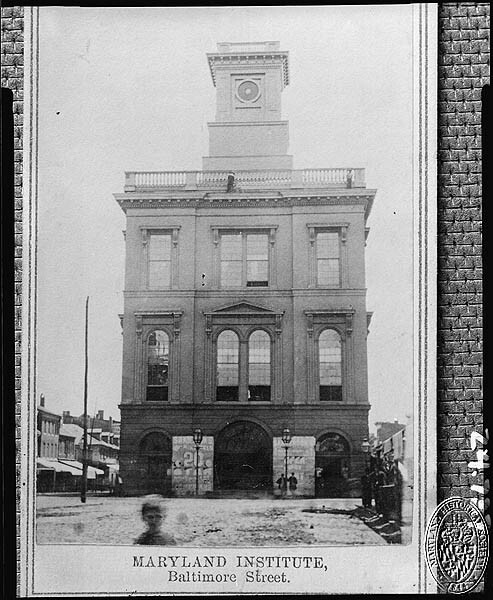 The city block-sized building located between Baltimore and Water Streets, along the Jones Falls (the current site of the Port Discovery Children’s Museum), was constructed in 1851 and was the first structure that was purpose-built for the school. The first building built especially to house the Maryland Institute. In those days, the Maryland Institute was kind of half art school, half vo-tech. Courses in mechanics, chemistry, and drafting were taught alongside painting, sculpture, and music. There were different schools within the school, with night classes offered so that working people could improve their skills and get better jobs. Another view of the Maryland Institute building. The building itself was quite spectacular. The bottom floor was a city market and the institute used the two upstairs floors. Along with classrooms and studios, there was a large meeting hall – one of the largest in the State of Maryland at the time – that was also used for public events. In fact, both the Whigs and the Democrats used the space for their party conventions in 1852. The structure was in continuous use from the time it opened in 1851 until the very early morning of February 8, 1904 when the Great Baltimore Fire spread east toward the Jones Falls. Being a relatively tall building for that part of town, embers that were blowing across town in the easterly wind hit the structure, and it soon caught fire – an isolated blaze at first that quickly spread to other buildings as firefighters were now facing a two-front battle. The remains of the Maryland Institute, 1904. No one knew it at the time of course, but the inferno was still more than 12 hours away from being under even moderate control. The Maryland Institute building didn’t stand a chance. Barely a shell remained once the fires were all totally extinguished a few days later. Obviously, the institution has survived to the present day, and has morphed into a more pure fine art and design school. It’s also nowhere near the Inner Harbor anymore – its buildings now exist in the Mount Royal / Bolton Hill area. So what happened? In the wake of the tragedy, the State of Maryland along with some wealthy benefactors and local business leaders, started looking for a way to rebuild. The mechanical and design skills that were taught at the school were extremely valuable to the local economy – especially when you consider the amount of re-building that a large part of the city was about to go through. A plan to split the campus was devised. 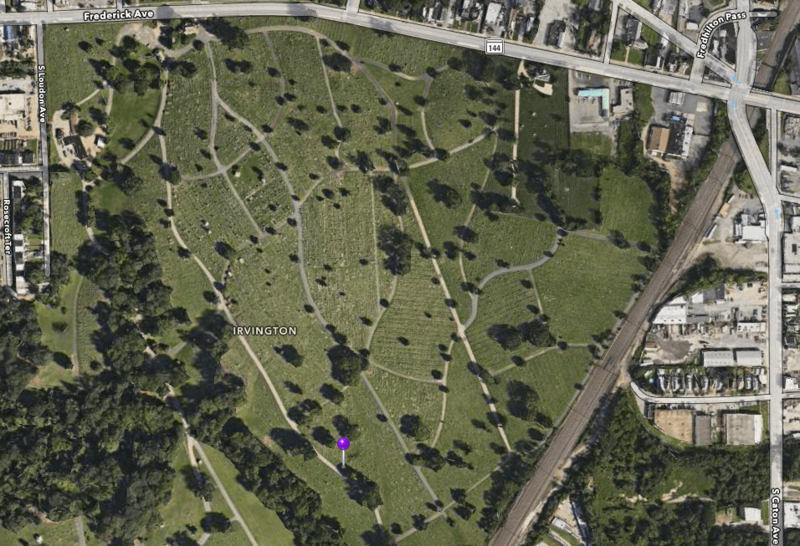 One piece of land in the Bolton Hill area was donated by Michael Jenkins to use as the site of a new building. Opened in 1908, this became (and remains today) MICA’s Main Building – housing the fine arts programs and even the first art museum in Baltimore. Another market building was constructed by the city at the original downtown site, and the institute’s drafting school would remain there – at least for a while. So now, let’s fast-forward a few decades. In the fall of 1977, my dad – George R. Skillman – started taking classes at the Maryland Institute College of Art. He’d always had an interest in history and architecture and those two subjects came together pretty perfectly in the aftermath of the Great Baltimore Fire. He had learned that MICA had been destroyed in the fire, and that the school he was attending was on the rebuilt campus. One day, his curiosity about that history led him to examine the dedication plaque for MICA’s Main Building. My dad’s name, carved in stone at MICA’s Main Building. Photo by George Skillman. Annotation by the author. Of course, this was obviously not referring to my dad. In 1908, his own father was still 13 years from being born. Who was this guy who had his name? The accidental discovery spurred my dad to take an interest in our family tree. He started talking to relatives who had done research, and started to collect family records – a task that wasn’t as easy then as it is today. I’ve definitely benefitted from the stuff he found, and have also done some work to expand on it. It turns out that this George R. Skillman wasn’t just a relative of ours, he was an ancestor: my great-great-great-grandfather. My dad is, at least indirectly, named for him. We don’t know as much about this forefather as we’d like to, but the few things that we know are pretty cool. He was the owner of a string of bakeries, and the inventor of a machine for making crackers. We’ve visited his gravesite, and the site of his largest bakery. We have some artifacts from his life – specifically some letterhead from his company. We also know that he must have done pretty well for himself to have served on the Board of Managers for such a large institution. My guess from looking at Census records is that the Civil War helped grow his business quite a bit. My theme lately seems to be that history is all around us. I really believe that’s true. Deeply personal discoveries are there to be made if you keep your eyes open for them. Who knows? You may even find your name carved in stone somewhere. I was recently reminded that 110 years ago today, a horrific fire swept through downtown Baltimore near the inner harbor. 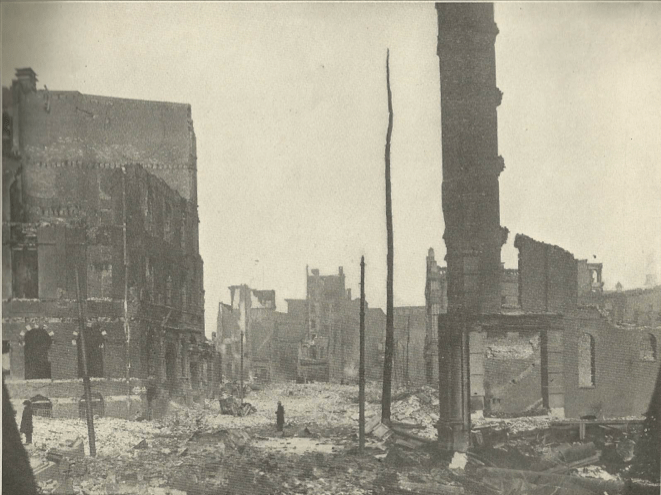 It was the third-worst fire in American history, behind the 1871 Chicago fire, and the 1906 San Francisco earthquake/fire. It started in the basement of the Hurst Building. Though we don’t know for sure, it may have been caused by a dropped cigar or cigarette left smoldering overnight among stacks of cotton fabric that were in storage there. The corner of Hopkins Pl. and modern-day Lombard St. The fire started here. By the time firefighters arrived just before 11am, the blaze was already out-of-control. The building partially exploded, sending flaming debris flying onto adjacent structures. Strong winds from the southwest gusting up to 30 mph also helped spread the destruction. Within an hour, firefighters recognized the severity of the situation, and a distress call was put out for help from other fire departments, and they came from as far away as New York. There was an early attempt to create a fire-break by blowing up the surrounding buildings with dynamite. 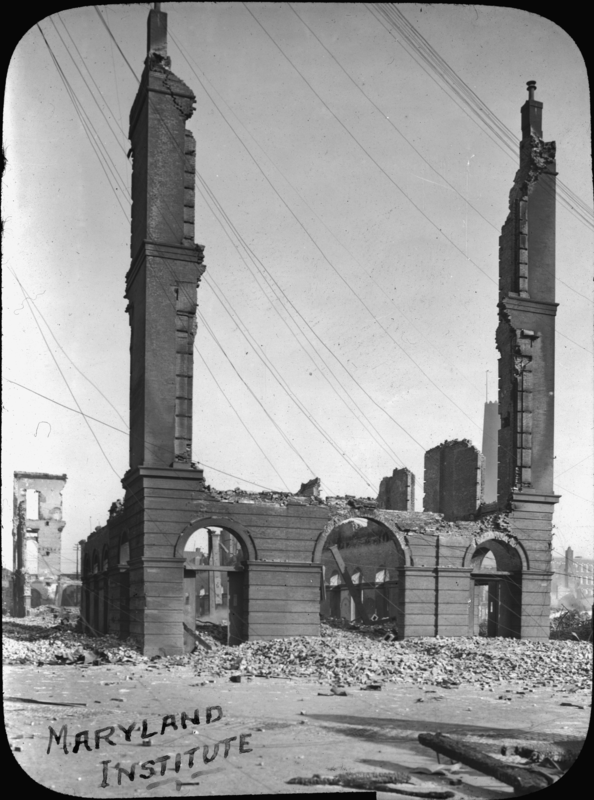 The mayor endorsed this plan with the thought that it would save more property than it would destroy, but many of the buildings were too strong to collapse, and the additional explosions only served to create more fires. It wasn’t until the fire reached the Jones Falls, and almost 1,700 firefighters had labored for nearly 2 days, that the fire was finally brought under control. In all, almost 1,500 buildings spread over 140 acres of the city’s central business district were completely destroyed. Estimated damages totaled perhaps as high as $175 million (roughly $4.4 billion in today’s dollars), with only about $32 million of that loss insured. As many as 35,000 people were put out of work by the disaster. This 1904 map shows the area of the city that burned for 2 days. 140 acres in all. Despite all the destruction of property, the death toll was almost non-existent. Many sources report that there were no deaths as a result of the fire, but there was at least one badly burned body discovered in the harbor in the days following the event. Several first responders also suffered injuries that would eventually lead to their death, but all-in-all, the damage was much greater in economic terms than in human ones. Amazingly, the city was able to (literally) rise from the ashes very quickly. Within 2 years, almost the entire area had been rebuilt using new city-wide fire codes, and more fire-resistant materials. 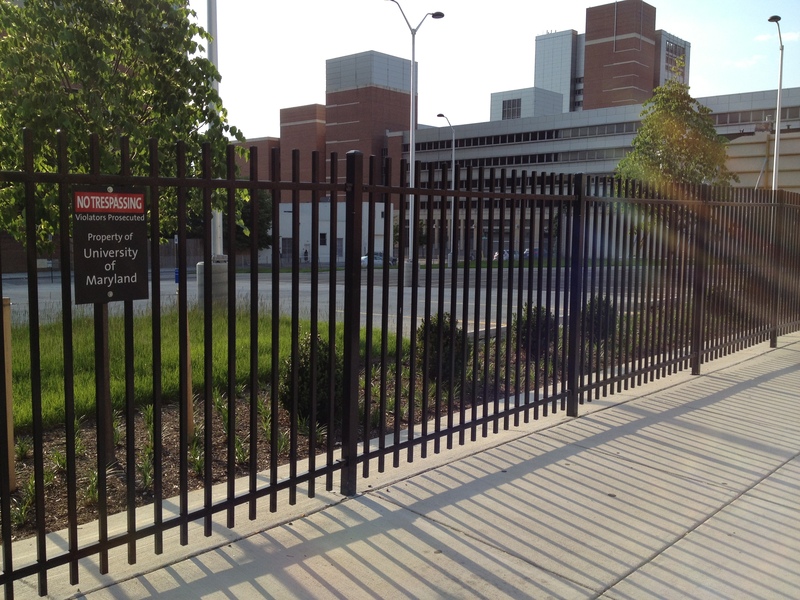 Even in the wake of tragedy, Baltimore got to have a fresh start. I first wrote about this local disaster a few months ago when I discovered a book about the fire among my grandfather’s things. I still have a PDF scan of the book available for people who want to see more photos of the destruction. Update: A friend points out in the comments that there is a great animated map of the fire that gives more detail of how it spread. It’s definitely worth checking out. Thanks, Laura! Update 2: My mother-in-law pointed out this wonderful collection of photos posted by the Baltimore Sun on the anniversary. I’d never seen a lot of these. Thanks, Karen! Since I was a kid, I’ve loved road-side historical markers. I always wanted to stop and read them, and sometimes (when we weren’t in too much of a hurry) I got the chance to. There’s something really great about seeing tangible reminders of history out in the world where you’re living. It turns out that I’m not the only person who feels this way. Several years ago, I discovered the Historical Marker Database – a hobby project of a history-loving IT guy like me – that seeks to catalogue every historical marker in the world. I make heavy use of the website when I’m researching, and it also makes for a fun way to go down a historical rabbit hole that I might not explore otherwise. You should definitely go check it out. As you might imagine, finding all these markers is a huge undertaking – certainly more than one hobbyist can handle. A volunteer board of editors has sprung up over the years, and thousands of people have contributed photos and descriptions of markers to the cause. When I was doing the research that resulted in my recent posts about the 138th PA along the Patapsco River, I discovered a marker that wasn’t listed on the HMDB website. I promptly registered for an account, read up on the editorial guidelines, and submitted an entry. People from all over the world can now discover the Mill Town History marker and learn a little bit about the town of Daniels, MD. So be on the lookout for the history around you, and please share it with the rest of us!